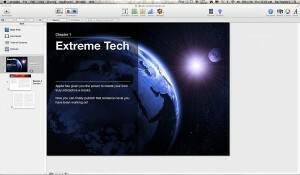 iBooks Author…Apple’s New Killer App? I know, I’m supposed to be talking about San Francisco during the week, but after yesterday’s announcement by Apple I decided to write about our cousin, Cupertino and Apple. I was excited today, but also a bit disappointed by the release of Apple’s new iBooks Author app for a number of reasons. I do think it was a good idea, but there are a few flaws that as I usually do, I’ll speak my mind on. First off, the program has a very similar interface to Pages, Apple’s iWork word processor. It’s a decent word processor, but it’s no where near a page layout program like Adobe InDesign. What you can do from the provided six templates is very simple and nothing like what you see in the video Apple has on its website. The multimedia effects are very cool that you can add into an iBook, but you need to have an eye for design or you’re just going to be tossing words on a page. This is great if you’re just trying to create something similar to a Kindle eBook, but the outrageous multimedia books in the video weren’t something your average home user could pull off in my opinion, at least not yet. You can do it, but you have to think more like a coder and designer than a writer, so there may be some additional work for me in the near future, since I do both. Will it kill the textbook industry? I’d like to hope so because you can put more in your iPad at less weight than you can in your backpack which having a daughter now I’ve had a bit of problem reading about kids having to haul around 40+lbs of books for school. Electronic is also cheaper than a hardbound college textbook that you’re at the mercy of having to purchase so they inflate the price charging between $60-$100 for a book that in a few years will be outdated. I have only one book from my college years that is of any use to me today. As I said, I’d like to see it happen, but currently they only have about eight textbooks covering a range of subjects, so the publishers that Apple has partnered with should step it up now. The other thing for people who want to publish a book is that first you need to own an iPad to preview it before you publish it and you also need to have that iPad tethered to your Mac. Our iPad is tethered to my wife’s Mac, so that means that any books I create as iBooks will now need to be copied over to her laptop to check them out before they’re released. While some people think this will rock the textbook world, I’m thinking it’s more a gentle rumble. I remember when desktop publishing started and there was really awful stuff produced for a few years until people figured out how to use it. Luckily that means that my daughter will be in second or third grade before it becomes more standard.